I have adopted the five-variation chanting of “Amitabha” from a common chanting tape and reproduced this portion repetitively in one long tape. Three hundred copies of this latter tape have been reproduced and offered to the public. Among other benefits, this tape can be used in our daily practice and as a companion to a dying person. That is why I wish to promote the circulation of this tape. While presenting this tape, I used to hand out a few short articles to explain the marvelous benefits of this chanting method. 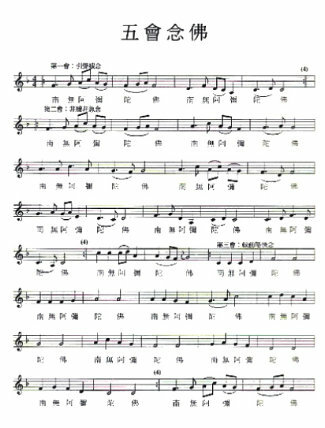 Now I am compiling all these articles into this booklet, with the addition of the music score, for long-term circulation. So far, the popularity of this tape has been beyond my expectation. Some people use the tape for morning and evening practice sessions. Some play it while driving to and from places. Meanwhile, some use it to help the dying persons to maintain their right mind. I heartily wish that everyone who comes across this tape would try to practice the chanting and thereby obtain its supreme benefits. Venerable Guan Ben presented in his book “Commentary Writings from the Fragrant Light Attic” a detailed study of the origin and content of the five-variation chanting method. He had also created new melodies and provided the music scores in that book. His intention was to purify the society by shaping the custom of chanting this divine music, and thereby bring about the ultimate salvation for all beings. Chanting “Amitabha” may be used as a group activity. It may also serve as a joint entertainment for the whole family. While chanting “Amitabha” our heart-felt feelings would come forth naturally. While listening to it, Buddha's name becomes engraved in our hearts. Chanting “Amitabha” can thus bring forth very powerful and effective results. The peaceful melody of this chanting would calm and purify our minds. Hence, I am very pleased to follow Rev. Guan-Ben in promoting this chanting method. Wise people should know that this five-variation chanting method, the associated sutra?chanting and visualization techniques are not my personal ideas. It is a sacred teaching that I have not revealed till now. I am afraid that the future generations might have doubt about this teaching and thus would fall into the lower realms. Besides, it is clearly stated in the holy scriptures that teachings can be given to those who are not already of the same faith and practice, only with the intention to benefit them. Now, having mercy on them, I will reveal it briefly. On April 15, 766 A .D., I was at the Mi Tuo platform of Heng Shan (a famous mountain in Hu Nan , China ). For the sake of achieving Buddhahood for all sentient beings and nothing else, I made a great vow to practice ninety consecutive days every summer for the rest of my life. This practice involves chanting “Amitabha” without rest in a Dharma-practice place. That was the first summer that I began to carry out this vow of mine. I was diligently and sincerely devoted to the practice. On the night of the fourteenth day I was alone in the Dharma-practice place at the northeast corner of the platform. At midnight I was thinking: “Currently there are numerous marvelous Purelands of the Buddhas in the ten directions. There are uncountable numbers of Bodhisattvas who frequently receive teachings on the unsurpassing and profound Dharma, and have obtained the supernatural powers to save infinite number of sentient beings. The reason that I am not involved in such great events could be nothing but the heavy obstacles that are consequences of my past sinful karmas. Since I do not belong to the holy assembly, I can not save other sentient beings.” I felt very sad upon this thought, and tears started to roll down my cheeks. In deep sadness I began to chant “Amitabha” in a mournful voice. While thus chanting, suddenly there appeared a phenomenon: The houses of my practice platform suddenly disappeared, all I saw were numerous platforms filling the universe, and they were emitting bright lights of five colors. Suddenly there appeared before me a golden bridge that instantly brought me to the Western Pureland . I prostrated to Amitabha Buddha. I asked the Buddha: “What is this precious Dharma? Please instruct me! Please instruct me!” Amitabha Buddha replied: “There is a priceless five-variation pure chanting of ‘Amitabha. '” This method is suitable for all sentient beings in the impure world. Just by listening to this chanting for a short while, all would generate the Bodhi mind. As it is described in the Infinite Life Sutra, the five sounds of the jeweled trees are precisely this five-variation chanting. Through this connection sentient beings can chant Buddha's name and will be born in my Pureland at the time when they will leave the world. All of you, who are spiritually poor and suffering, will be able to remove all sufferings by coming across this priceless jewel of Dharma. It is like a patient obtaining the needed medicine. It is like a thirsty person obtaining water. It is like a hungry person obtaining food. It is like a naked person finding clothing. It is like a person in the darkness getting light. It is like obtaining a boat for one to cross the vast sea. It is like discovering a treasure. Thus ease and happiness are ensured. Why is that? All sentient beings who encounter this Dharma treasure will be able to chant the Buddha's name. By so doing, they are sure to cross the ocean of suffering and reach the shore of no regression in just one lifetime! After that, they will quickly accomplish the six prajna-paramitas, possess the all knowing wisdom and quickly become Buddhas. Thus they are sure to enjoy the supreme peace and incomparable happiness. After Buddha said the above, I suddenly saw my body back in the Dharma-practice place. Having seen this auspicious phenomenon, I felt happy and excited. Ever since then I have chanted Buddha's name as I was taught. Just as Amitabha foretold, I have no more doubt whatsoever. I heartily pray that I may, in this and future lives, always teach this wondrous method to sentient beings in Samsara and thereby deliver all of them to the Pureland of Ultimate Bliss. I heartily pray that they may then soon become Buddhas. May all who hear or read about this chanting method be free from doubt or slander. From a Buddhist chanting tape I have adopted the five-variation chanting of “Amitabha,” and recorded it repeatedly into one tape. Thus the whole tape becomes an endless run of the five-variation chanting. It so happened that each side of the tape ends with a complete chant of “Amitabha” in the first variation, and hence it continues naturally into the beginning of the other side which is also in the first variation. Such a nice and harmonious coincidence could be nothing but the grace of Buddha! This tape may be played frequently at home. The atmosphere will be transformed into a peaceful and harmonious one, and the Buddha's name will be naturally planted deep into the heart of every family member. Listening to the tape during illness, one will feel peaceful, comfortable, and the karmic obstacles will gradually be removed. As a result, one's health will be restored sooner. This tape may also be used to help a dying person. It is easier to play the tape and maintain the chanting of “Amitabha” by a machine than to gather friends to help with the chanting. One should prepare a small tape recorder which can be powered by AC or DC against the loss of power. This recorder should be placed right next to one's bed so that it can always be reached easily. After I made this tape, I played it once or twice every day. Only two days later, while sleeping at night, I suddenly heard a loud playing of this tape for about one minute. There was no one in the vicinity playing this tape then. I had heard about such mystical experiences before. Now that I have personally experienced it, I keenly appreciate the deep blessing from Buddha and the Bodhisattvas. Presently, I have reproduced forty-eight tapes and sent them to my friends in the Dharma for sharing. I further wish that this tape will be reproduced and distributed by them so that the Dharma sound will be dispersed everywhere and all sentient beings benefitted. The five-variation chanting tapes distributed last time were very popular. Professor Shi-Lun Tian of Taiwan , Mr. David Zeng of Miami , Ms. Mei-Ling Jiang and Mr. David Yang of California also re-taped many copies for further circulation. Mr. Feng-Wen Jian of Taiwan has sent me a tape that contains five-variation chanting of “Amitabha” accompanied by piano. This version is even more pleasant to listen to. Because the forty-eight tapes made last time have all been given away, I have asked Ms. Mei-Ling Jiang to make a ninety-minute tape of repetitions of the new version. I have reproduced forty-eight copies of this new tape for circulation. After reading your letter carefully, I played the five-variation chanting tape that was made the first time and compared it with the new tape. I found the first tape was more solemn and slow-paced. Hence it is easier to calm one's mind. The new version is more melodious, softer and pleasant to hear. Compared with mere repetitions of the Buddha's name, singing Buddha's name seems to be more effective in cutting through the limitations of rationality. One naturally pours one's feelings into the singing, and thus the chanting becomes whole-hearted. I have purchased a small tape recorder and carried it with me. Wherever I go, I would play it to let people hear this chanting and thereby create a good karmic connection for them. When I enter my car, I would use the recorder in the car to play this chanting tape. On occasions such as praying in the cemeteries for the lonely spirits, offering food to pigeons, or setting turtles, birds and fish free, I always play this tape. Playing this chanting tape all the time helps me to detect if the chanting in my mind is continuous. My second son, Frank, is twenty-three months old. Initially, he was only able to chant along “TUO FO.” Due to constant playing of the tape, he can now sing along the whole name “NA MO A MI TUO FO.” He frequently requests to have this tape played. If we want our children to chant Buddha's name, playing this tape will naturally bring our youngsters into the subtle method of singing Buddha's name. Therefore, I am grateful to Rev. Guan-Ben who was the first person to promote the five-variation chanting of “Amitabha” in recent history. May Buddha's grace be with you! I have an idea to establish a “Buddha Name” radio station and broadcast the chanting of Buddha's name twenty-four hours a day without interruption. We can thus help create wider karmic connections with Buddha. It will be easier to help more people during their final hours. Furthermore, any person who accidentally tunes in to this program may gradually become a long-term audience. We can further form a “Pureland” TV station which transmits only the five-variation chanting of “Amitabha.” The screen should display the statues of the three holy deities of the Western Pureland —Amitabha Buddha accompanied by the Bodhisattvas Avalokitesvara and Vajrapani. The background should show a scenery of the Ultimate Bliss World. Before the statues there should be the offerings of incense, lamps, flowers, fruits, etc. The management for this type of radio or TV station is very easy. Most of the time only the machine is running. We only need someone to maintain the machines in good working condition. The fund may be obtained from the donation of the general Buddhists. You are a respected leader in both international and Taiwan Buddhist organizations. If you would promote this idea, I am sure that the majority of the Buddhists will respond to your call and establish a permanent organization for the spreading of this chanting. Your letter dated October 21st has been received. You have adopted the chanting and repeated it to make it ninety minutes long. By adopting only the chanting of “Amitabha” you are enabling the audience to maintain a continuous flow of Buddha's name. The merit of your rearrangement is limitless. I have also received the new chanting tape that you kindly sent me. Thanks! As to the establishment of the Buddha's Name radio station and the Pureland TV station, we need a person like Madam Tian to provide the lead. Before this ideal can be realized, it would be nice to have someone following your idea in first making such video tapes. Then each Buddhist family may have a copy to play frequently and thereby plant the seed of chanting “Amitabha.” Through eyes and ears, the impression of Buddha's image and name will be deepened. If someone would utilize the modern technology to produce a video tape on the Sixteen Visualizations of Pureland, it will be greatly beneficial to the Pureland practitioners. It will familiarize the practitioners with the Pureland visualizations and help them to obtain rebirth in the Western Pureland . This may be achievable through organizations such as the Buddha Educational Foundation in Taiwan . Your letter dated November 22nd was also received. I have also received two packages of “The Merits of Practice in Cemeteries.” Thanks for providing me Mr. Sun Yi's address. Today I have sent him fifty booklets and other Chenian Chinese booklets (about five to a dozen each) through surface mail. Mr. Sun can then distribute them to friends who like it. The article entitled “Comments on the Summary of the Naga King Sutras” has been received. Thank you for allowing me to read your manuscript before its publication. May you be happy in Buddha-Dharma. There are many Dharma chanting tapes currently circulating in the stores. In order to help people at their final hours and to help daily practice, I adopt only the five-variation chanting of “Amitabha” from these materials. I omit the praises and the dedication of merits. Professor Shi-Lun Tian wrote me a letter saying that this Dharma-chanting tape is the most preferable one that she has ever heard for the past several decades. She listened to the tape once in the morning and once in the evening everyday. She also introduced this tape to the public. This tape lasts ninety minutes. This is because sixty-minute tapes will require more frequent change of sides, while one-hundred-twenty-minute tapes are thinner and hence easier to break. I, therefore, choose the medium length tape. The benefits of the five-variation chanting of “Amitabha” are described in the attached articles and correspondences. Your Center has been diligently promoting Buddha Dharma and has made numerous contributions. It is greatly respected by all. I am humbly offering one tape with explanations to your Center. Perhaps it can be considered for use in your Dharma spreading endeavors. Best wishes in the Dharma! My Guru, Yogi Chen, entered into Nirvana in Berkeley , California on November 13, 1987 at 9 A .M. 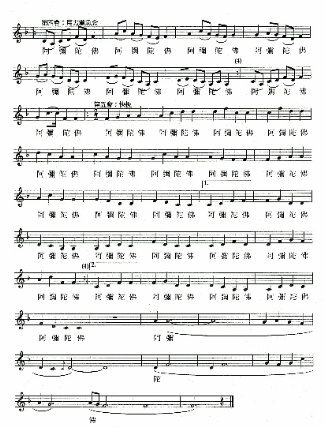 At that time both Ms. Bao-Lian Tan, serving at his side, and a visiting Mr. Cai heard the heavenly music of five-variation chanting of “Amitabha.” It was clear and melodious. The realizations of Yogi Chen are unfathomable. He had experienced the identification with the Adi Buddha, the Great Pleasure Vajra, etc. And yet, at his time of entering Nirvana, he purposely showed this method of five-variation chanting on Amitabha. Under this exhibition of a miracle was the following teaching that sprang from his great compassion: through the door of practicing this chanting, one can easily escape from Samsara. As we remember this auspicious inspiration which was his last teaching, we should practice this chanting diligently and promote it vigorously so that we might show our gratitude to both Buddha and Guru for their infinite kindness.